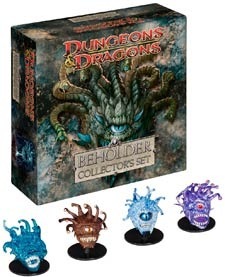 Beholder’s Boxed Set available now at Canton Games! Check out this beautiful new release from Wizards of the Coast. Four prepainted beholders for use in your D&D campaigns. Each one comes with a full color Dungeon Delve stat card. Come get yours today and save 10% at Canton Games! This entry was posted on Monday, November 15th, 2010 at 8:07 PM and is filed under Uncategorized. You can follow any responses to this entry through the RSS 2.0 feed. Both comments and pings are currently closed.